The increasing costs, higher deductibles, and decreasing benefits of many health insurance plans translate into less quantity and quality of care for many patients seeking physical therapy. 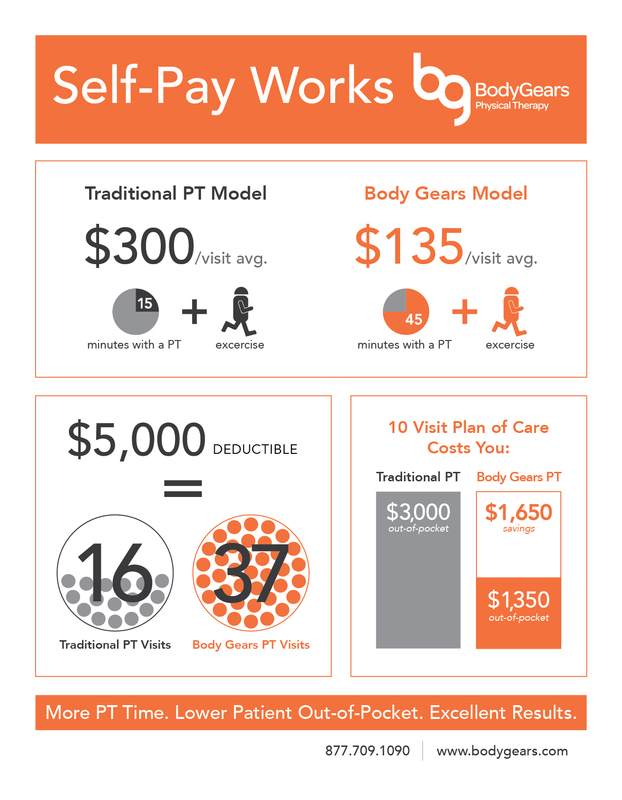 Here at Body Gears, we don’t compromise on quality, giving patients more one-on-one time with a physical therapist (PT) at a lower cost (on average, $135 per visit versus $300 at a typical facility). Patients receive 45 minutes of intensive, highly specific, hands-on therapy followed by closely monitored time spent exercising. At most clinics, patients only receive 15 minutes alone with a PT followed by exercise. Given the typical cost per visit, consider that a policy with a $5,000 deductible you will need to pay for 16 traditional PT visits before meeting that deductible. For the same amount of money on a self-pay basis you receive an average of 37 PT visits at Body Gears, an incredible value! Patients who opt for PT at a traditional clinic and have not yet met their deductible may face up to $3,000 out-of-pocket fees for 10 visits whereas a self-pay patient at Body Gears may only pay $1,350 out-of-pocket for the same ten visits, with more time per session; that’s a savings of $1,650. This makes it very feasible to self-pay for visits rather than going through an insurance policy that likely limits the number of PT session you may receive. More quality one-on-one time with a PT will get you the results you’re looking for and will equip you to maintain those results in the future. Check out our graphic on the ways self-pay visits can work for you!